Blood Suckers 2 is a blood-chilling 5-reel 25-payline video slot from the NetEnt production. The 2017 release is the sequel to one of the most popular online slots, Blood Suckers, by the same developer. Blood Suckers 2 slot takes you on an adventure with Amelia, a representative of the new generation of vampires, who is ready to get revenge against vampire hunters who killed her family. The slot boasts high-quality graphics and loads of lucrative bonus features that will help you win big. Join revengeful Amelia and win up to 250,000 coins in a single spin. Unfortunatly, the average return here stands on 96.94%. It’s really not bad, but far below the original game, which is the highest payout NetEnt slot. Compared to the original title, Blood Suckers 2 features more polished graphics and cartoon-like animations with Amelia standing on the left side of the reels with her crossbow inviting you to join her. A thrilling soundtrack adds to the overall atmosphere of the game which creates suspense and anticipation. Besides Amelia, the slot is home to symbols portrayed as other members of the vampire family awarding mid-value payouts and playing card suits that deliver low wins. The base game can be quite exciting with two random features activated on a regular basis. This is the major difference between the original title and the sequel bonus wise. The random features include the Scatter Shot and Bonus Shot features. 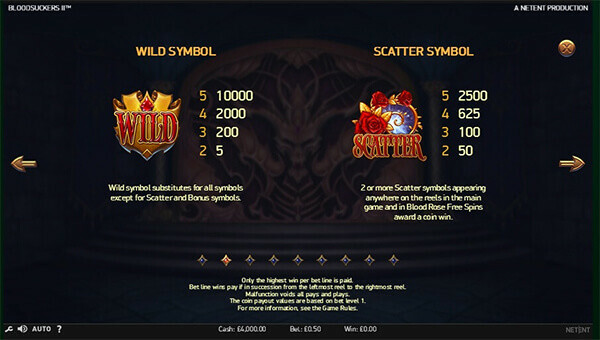 The Scatter Shot feature can be randomly triggered and it will add Scatter to 2 Scatters already on the reels thus helping you unlock the free spins game. In addition, all medium-value symbols on the reels will award cash prizes of 10 to 100x the bet level. The Bonus Shot feature adds one extra overlay Bonus symbol to the reels 1, 2 and 3 which can help you trigger the Hidden Treasure Bonus Game. Just like the original game, Blood Sucker 2 offers two bonus games – Blood Rose Free Spins and Hidden Treasure Bonus Game. To trigger the free spins feature, you need to land 3 Scatters anywhere in view. Since the game features two special symbols, the free spins feature is not easy to trigger, but if you manage to do it, you will win tripled payouts during it. The Hidden Treasure Bonus Game is even more difficult to trigger as you have to land Bonus symbols on adjacent reels starting from the far left, but if you succeeded to unlock it, you can win up to 16,750 coins. The possible win can be even bigger if you trigger the game with 4 or 5 Bonus symbols. In this case, coins wins are doubled or tripled, respectively. During the 5-level bonus game you are supposed to open coffins to reveal coins wins, Scatters, Keys or the Demon. The game is over when the Demon is revealed. Blood Suckers 2 is a medium to high variance game with the theoretical return to a player of 96.94%. The paytable is quite attractive with the top paying Wild symbol promising a 10,000 coin jackpot. However, you should not expect that you will hit wins frequently while playing this NetEnt title. Instead, configure your bet well and be patient as some large payouts may come your way, especially during bonus games with coin wins and tripled payouts.